It is very sad. I am really upset with this. As a consumer, I want to protect them from heart worms but am subject to my vets advice and that of the manufacturers. I really thought we might lose her. Luckily she did not have seizures. " Of course my heart dropped as I read that, and then I praised God the puppy will be okay. She is about 5 months old and is MDR1 normal/normal, so we can't just write it off to the MDR1 mutation. BUT, had the customer LISTENED to everything I stated on "go home day" about Trifexis and also Heartgard, this could have been avoided. UPDATE: RIGHT AFTER POSTING THIS PAGE I GOT MORE EMAILS FROM PEOPLE WHO READ THIS INFO, AND HAD A DOG OR KNOW A DOG WHO HAS A REACTION TO TRIFEXIS. I had planned to make a page with this information for some time, and this compelled me to not put it off any longer. I have long tried to warn people of the dangers of flea and tick products. What is considered especially risky are the newer ones, with less of a history of reaction. Trifexis is one such product. Revolution is another that has killed at least one dog I knew personally (a large mix breed husky/shepherd mix.) Capri is one of two of my pups who have reacted to Trifexis after being given the product by well meaning owners, who trusted their vets. Having been involved in dogs as long as I have, I have seen a number of new products released to the market, only to be recalled after a year or two and many dogs have been sickened or killed. I refuse to use my dogs as guinea pigs with new products and try to get others to understand this as well. All products made to kill or repel insects and other parasites are poison, and owners must not forget that. Some are very potent and all come with warnings in fine print, as well as a list of side effects. Many times this info is not provided to owners, or if it is it is not read. The application of these products must not be taken lightly or your pet could pay the price. And if it is at all possible to avoid them, that is ideal. And if you must use them, do so minimally and watch your dogs for reactions, either from first application or cumulative effect. Even changes in behavior such as avoiding you when you apply the product are pretty telling. My own dogs would try to get away when the smelled Frontline Plus, the topical kinds for between the shoulder blades, which I used many years ago. I considered it one of the safer ones. However, if I got any on my hands it would give me a bad headache within minutes and I suspect it did the same to the dogs, based on their reactions. I haven't had to use any flea and tick products in many years other than Frontline spray. I think part of it is my dogs are on a natural, wholesome diet and lifestyle, giving them optimal immune systems. That can help make them less attractive to pests, though isn't foolproof. You can also research natural alternatives, since many are safer and effective. I also use Skin So Soft by Avon and the benefits are helpng much more than with just fleas and ticks. We spray the dogs and ourselves when we are outside, especially at night by the pool, and we hardly ever get bitten and it keep those pesky mosquitos at bay. I have also had people ask about flea collars. I can't imagine putting one on my dogs, not even the newer ones. Putting poison right up by their faces, around their necks, seems even worse than the topicals that go on their backs. I guess to me it would be like spraying Deep Woods Off around my neck and not washing it off for months, of course reapplying to keep it strong. I can't think of anything more awful. Most of them are not that effective in the first place, so again you cause harm with little to no benefit. 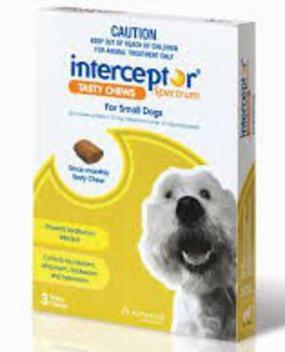 Many people have written to ask me what to use for heartworm preventative now that Interceptor Plus is easy to find. I am again recommending Interceptor. 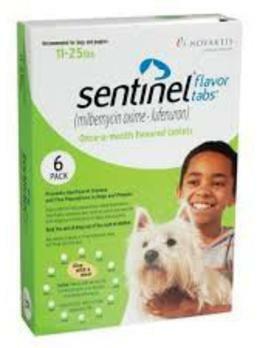 You can also use Sentinel Plus as I have for many years without one single issue if you would like. Both work equally as good, but Sentinel tends to be a little bit more pricey. If you have purchased a puppy from me, then your dog is clear. Give the dose when you can supervise the dog for the day and note any change in behavior. From what I have read and what other experts have said, these are the only two heartworm medications that are safe for an Aussie Remember though, you assume risk with any medication and you need to make an informed decision after reading the risks. The active ingredient in Interceptor is also on the list of drugs with possible side effects on the Washington State VCPL site, but Interceptor has long been recommended as "safe."